In the last 6 months I’ve had two competitors, both of which I didn’t view as competitors toss up some pretty nasty comments about me. To me this is a sure sign that the competition is worried. One of them took a potshot at my Search Engine Optimization abilities. I now rank above them in ALL the major search engines. Morons. The other company took a pot shot at me for linking to them in two separate articles. And our front page is “nofollowed” and they thought we did this intentionally to somehow cheat them of our precious pagerank. This same company trashed me personally at Wikipedia for being a ‘website flipper’. Somehow my company managed to get a link and the bigger company didn’t. I’m a website flipper. OMG. This is like being apart of Al Qaida. Even though I’ve owned this company for going on one year and have no intention to sell it. I’ve never been happier with my online pursuits and I’m no longer in the ‘flipping business’. I started this business and I don’t plan to sell it unless an unbelievable offer came to me. Besides is it any of his business anyhow? Don’t worry what I’m going to say next will probably shock my partners, and even me. I’ve decided to start printing a magazine the same way JPG Magazine started out and competing head on with so called industry leaders just because I think it’s a great affordable way to get into the faces of savvy folks in this industry. 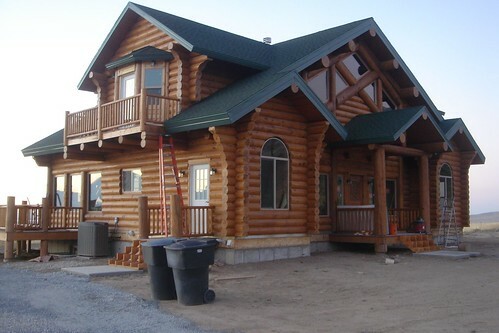 I’m not sure if it’s this year, or next but Log Homes Journal, the print edition is coming. So go ahead competition start sweating it out. Or maybe this is a bluff. Either way I’m sure you guys have better things to do than worry about a simple team of bloggers right? When your competition starts to talk about you on the same level as big companies then you know you’ve made it. If you’ve made it on the same level as big companies with big money you are on the right path. Keep forging ahead. Ignore the competition at all costs and do what’s in your heart. Success usually follows. I see you have great rankings for interior doors but not too much to choose from. Would you be interested in partnering up with my company for interior doors ? If you are open to this idea lets talk. Just sent you an email. Thanks for stopping by. Let’s talk more and see what we can work out. u called them morons.. does tht mean u r slightly worried abt d competition too 😉 ?? ?